A Collection of 18 Songs for Worship & Praise! Lead Sheets with guitar chords and some vocal parts. 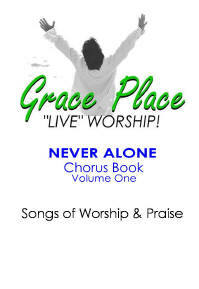 GRACE PLACE "LIVE" WORSHIP, NEVER ALONE, Chorus Book $2.95 BUY! 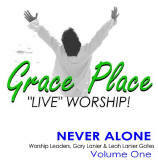 GRACE PLACE "LIVE" WORSHIP, NEVER ALONE, 10 PAK $34.95 BUY! UNLIMITED COPY LICENSE $19.95 BUY! Purchase this license to make UNLIMITED COPIES of a purchased book. An order of one purchased book must accompany this product. Listen below to short excerpts from GRACE PLACE "LIVE", NEVER ALONE Listening CD. for Believers all around the world. Or Call: 580.584.2889. Give your name, business, shipping & billing address, and the music order, including Quantity, Title, Catalogue #, and Price. A shipping & handling fee of $5.00 will be added to all billed orders.